Without any idea of where to take our adventure this week, I suddenly had a brainstorm to go visit Northeast Woods in Comox. This area is a place I have been familiar with for the last few years. I am not sure if that is because I have not spent very much time in Comox beyond working and going to the beach, or that this place is a hidden gem that hasn't publicly promoted as a fine place to recreate. I am glad we made the trip. We began by parking our car beyond the Comox municipal works yard off Torrence road. Highland Secondary school and several playing fields are also in the vicinity. This general area has many beautiful stands of timber and I often wondered why there was such a forest in seemingly prime building land. Now I know. Northeast Woods was slowly protected over the last 40 or so years. There was even once a municipal landfill in the area. It was fully granted as a Wildlife Management area in 2001. 313 acres are covered in the management area, and this is an important place for migratory birds and waterfowl, as well as deer, small mammals, fish and amphibians. We unfortunately did not see any wildlife, the evidence of woodpeckers abound. Many rotten standing dead tree trunks were riddled with holes. With no map or any direction we just began following trails, changing our path whenever a new one presented itself. We found a few built up jumps that Natalie had fun running and leaping off of. I tried to photograph her mid jump. Now that is a challenge that I couldn't meet. Lots of fuzzy pixels. Marshall also joined us today for some fun in the woods. It is so joyful to watch him bound through the brush looking for tossed sticks and is back before I turn around, stick in his mouth, waiting for me to throw it again. The sign at the trail head showed dogs on leash, but all the other canines we encountered were off lead, so I quickly allowed Marshall that freedom as well. The forest was a mix of Douglas fir, Western red cedar, red alder and surprisingly Sitka spruce. It don't often spruce trees that numerously. Also many prickly, deep green, holly bushes were sprinkled about the undergrowth. Salal bushes were very healthy with broad, lush leaves and tall stems. The ground in this area is fairly moist, in some places close to the swamp are down right wet, which would account for the happy plants and trees. We munched on Indian corn (flowers of the Oregon Grape bush), admired trilliums and smelled skunk cabbage. Natalie climbed in a rotting burned cedar stump. We ate girl guide cookies and told jokes. It was a peaceful time. The landscape has little in the way of elevation change. No big hills for kids to have to climb and complain about. "It doesn't smell that bad"
The trails are mixed use, some are reserved for walking or running only, while others are for sharing with mountain bikers. I am looking forward to taking my bike for a few hours exploring the different lines. I would suggest these trails are beginner/ intermediate. A couple of small jumps and roll off drops, but little in the way of roots and other technical features. I like the twisty and tight corners. With little elevation change riding up and down for a few hours would be less tiring than Cumberland riding. Natalie was a lucky girl this weekend. I stopped at Trail bikes on Friday after work to have a look at kids bikes. There was a sale on Trek bikes. 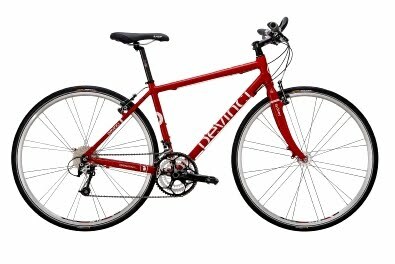 I am very happy with the new Trek that I bought a month ago and the customer service was second to none. 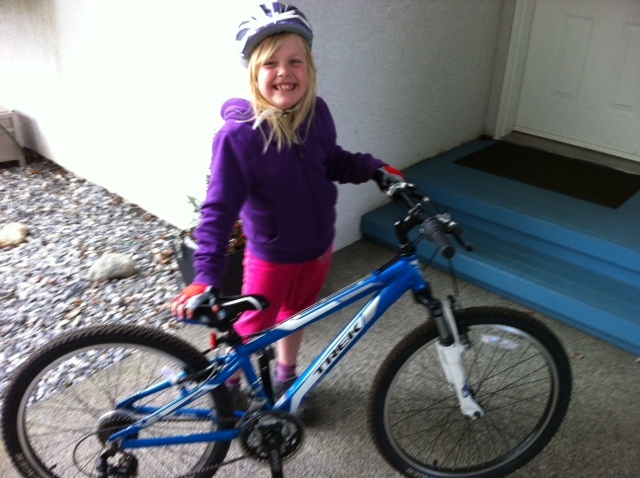 I picked out a new 24" mountain bike for her, and on Saturday we went to pick it up. She was thrilled. It has been 4 years of me encouraging and helping her to get comfortable on a bicycle to hesitant responses. Sheena helped her out three weeks ago, and that help more in that hour than all the time I had invested. So we practiced on the trail behind the shop and she was able to ride without assistance after I helped her to get started. A little more practice yesterday, and she was so close. So today I reasoned that today she should get out again since she wouldn't have another chance for a week. After my help a couple of times, she was determined to ride on her own. She pushed off, got her foot on the pedal and she cranked herself down the road! It was amazing. She hit the brakes and off she went again. She spent half an hour going back and forth down our street, starting and stopping. It was so thrilling for me. She had a smile on the whole time, and it was so joyous to see. I believe the hardest part has been overcome and she will just build skills from here, and she will be ready to ride across Canada with me when she graduates high school. Have a great week everyone. Get outside and enjoy the gorgeous spring weather and get your kids out to learn the natural world. Find Adventure.